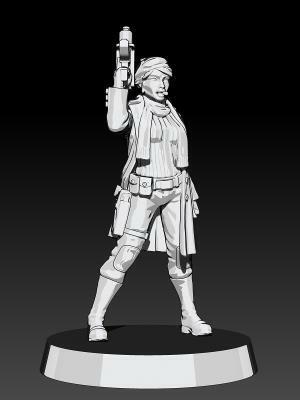 Yesterday, I put a couple of preview renders of the Resistance Cell Officers on Facebook. I'm not normally a fan of showing renders of my work as I don't think it's a particularly nice medium, especially for figures sculpted to be miniatures. However, the new Zbrush update has some new 'posterization' render settings that give a nice cell-shaded look; I find this much more pleasant and indeed flattering than the usual renders! Now, I know very little about the rendering process and don't intend to spend too much time learning it as I'm rather busy sculpting for printing, but I had a quick fiddle about and came up with these. Lots of room for improvement, but I'm glad to have found a render option that I'm happy to show the world! These figures will be sold together and both feature separate right arms (cut at the handily placed arm-band) that can be swapped between the figures. Doing this actually changes the pose quite considerably, so along with the usual separate heads, these figures should have a lot of posing options. I've also designed a weapon option sprue for even more variety. For later release I have more figures planned that will use this arm sprue, as it provides me with another method of adding variety to the Resistance Fighter range. 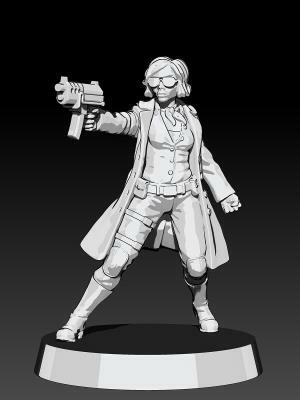 Also coming soon is the Commissar Vespera Venko. In the hope of boosting our progress towards the Prize Draw, if we get a few more 'Likes' over the weekend on the main Statuesque Miniatures Facebook page, I'll show you a preview of her, too! Very nice! Good step, you are sorting the difficulties of innovating after all the releases. Thanks, Anibal. Lots more to come, too! Superb , I didn't know you sculpted digitally. Cheers, Neil. Made the switch to digital with the Resistance Fighters and haven't looked back!